Here is how I rebuild my RD400 cranks. It is not the only way to do it and may not even be the best way to do it. But it works for me. If you are not confident then get expert to do it for you. If you stuff it up don't blame me but it is not rocket science and if you have half a clue you should be right. 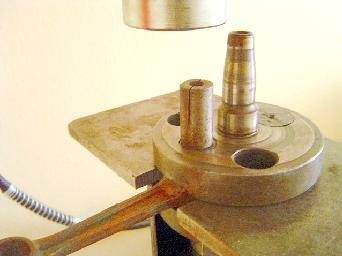 Crank Stand...a piece of pipe with a slot cut in it. Push pieces...little bits of bar. 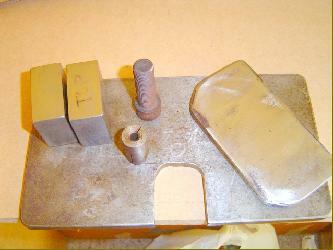 Various bits of 10mm plate. First thing is to remove the outer bearings from the crank. 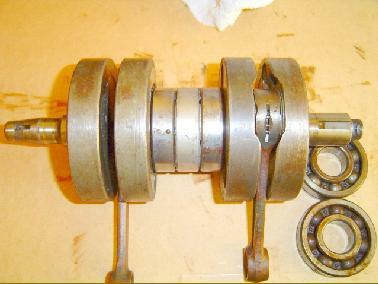 You can use a bearing separator to get the bearings off. But on made my own that wedge the bearings up and off. 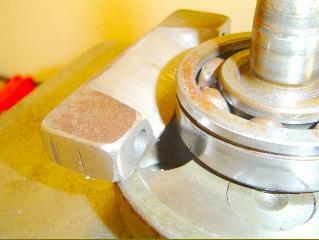 Remember that you are replacing these bearings so don't worry about hammering on them. 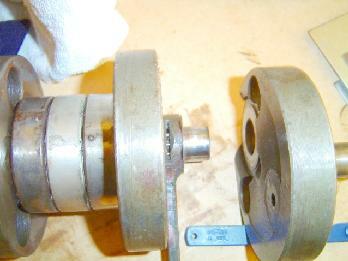 Bearings have been removed from both ends of the crank. Above you can see the plate with the U shaped cutout in it. By placing this between the outer webs and then putting the whole thing into the pipe you are ready to push out the first web. The pipe has a cutout in it to give clearance for the conrod. The bar and the cap screw in the picture are my push pieces. To blocks are spacers that we will use later. 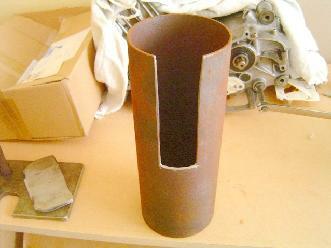 Place the crank and plate assembaly into the pipe as showen. Then put your push piece onto the web pin then press down with you hydrulic press. This will push the pin and the rest of the crank down.Leaving the outer web free. It should end up looking like the one pictured above. 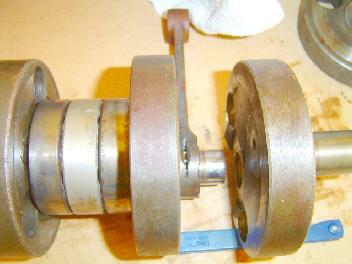 Remove Thrust Washers/Conrod and Big end Bearing. 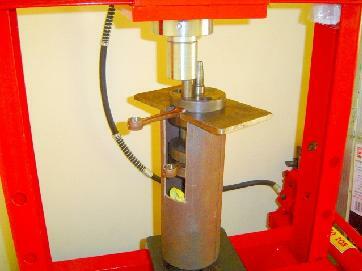 Do the same at the other end and remove Thrust Washers/Conrods and Big end Bearings. 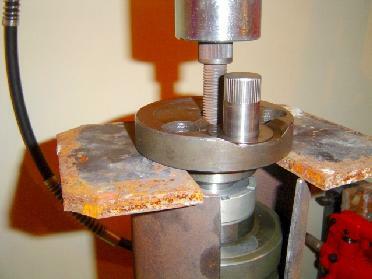 Put what is left of the crank back into the pipe and support it with two plates either side of the center bearings. 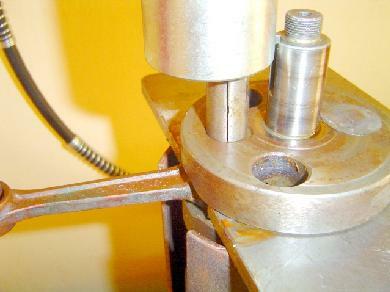 Put you other push piece onto the center of the splined shaft. You will see what I mean as there is only one side you can press from. Pump your press down until the center webs are pressed apart. So This Is What You Will Have …Simple Wasn't It ?